Festival season is here. Everybody is full of enthusiasm in the season of festivals. I am no exception. Thanks to various sales going on everywhere, I am stocking up on various items for gifting purpose. Diwali is round the corner and wedding season is already on the go. So we can say this is the season of shopping and gifts. We all want someone to make us feel special and we too want to make our loved one feel really special and what’s better than to gift something really special which makes the other person feel really loved. But so many options available in the market makes it really tough to choose one thing. And also you can not rush from one shop to other as roads are really jammed these days and going out for shopping means wasting your whole day. Like yesterday I managed to go out to shop some really special gifts for Diwali but all in vain as traffic jams didn’t let me reach anywhere and after that, I was so tired that I was in no mood to see anything. Then I thought of shopping online as this is the best option available. While surfing online I got to know that flipkart.com is giving away ASUS ZenPhone on really discounted price. And what can be a better way to bring smile on your loved ones face than gifting a phone. wouldn’t you love it yourself!! Anybody listening!! I would love to have Asus ZenPhone as a gift this Diwali :P.
Now, this is #HarPalHappiness Offer, where customers buying a ASUS Zenfone will get a chance to win Flipkart gift vouchers worth Rs.1,000 every hour. And, one lucky customer will also stand a chance to win gold vouchers worth Rs.25,000 every day! Oh yes, so many offers. Now you need to be benefited and me too :). So, let that special someone in your life feel more special by gifting this wonderful gift and stand lucky to win awesome gifts yourself too. I have found that special someone in my papa whose old phone is just counting its last breaths ;). Let me make him the lucky one this time :P.
Jokes apart. Our parents do so much for us. That first cycle, our first mobile and those endless gifts and our unreasonable demands!! Now its our turn and we such offers around us, we should make full use. What are you thinking!! Have you found your special one!! One more option. You can Gift Yourself Happiness by either buying it yourself or by forcing your someone special to gift it to you. In that way, it will be a more memorable Diwali for you :). Lets have all the advantage and make this Diwali special. don’t delay. Offer ends on 11th November, 15. Great offer ! Thank you for sharing.. Happy Diwali ! Lovely post, thanks for sharing this. Yes. 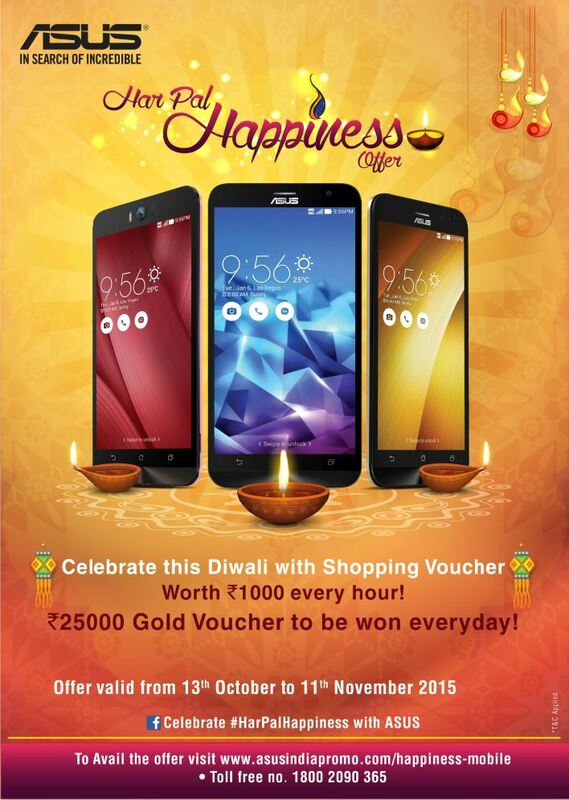 Its great offer to won asus phone as Diwali Gits. when this festival comes people are think about to buy some different gifts like sweets, diyas, gift hampers and many more thing.